Our family is always on the lookout for fun games to play together and we’ve been big fans of Scrabble. 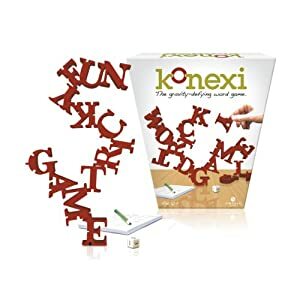 When I heard there is an interesting game out called Konexi, I jumped at it. It’s like a cross between Scrabble and Jenga. You balance the letters carefully to create words. The strange thing is that the letters don’t have to be in the correct order to count as a words as long as all the letters are touching. Here is an explanation. In this example, you could add the letter N to the left branch to create the word “wine,” but you couldn’t add it to the right branch because that doesn’t make a word and it doesn’t connect to the W and I on the left. Sadly, every place I’ve found that sells this game has none in stock. I guess I’ll have to wait until it becomes available to try it out with my family.